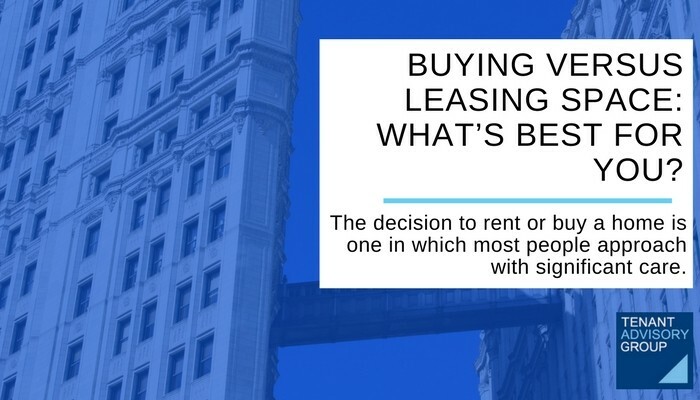 Buying Versus Leasing Space: What’s Best for You? The decision to rent or buy a home is one in which most people approach with significant care. It’s no different when evaluating whether to buy or lease with regards to commercial property. This is a critical decision in a company’s development and requires extensive analysis. The Tenant Advisory Group, LLC (TAG) has significant experience helping a diverse group of companies navigate this decision. There are several important factors to keep in mind when addressing the question of leasing vs. buying commercial space. On the top level, a company will want to consider the state of their industry, their own firm’ growth projections, and the amount of capital available. The results of this high level analysis may make the choice of buying vs. leasing relatively easy. However, if the choice isn’t clear after this review there are additional factors that will then be considered. TAG can assist you in this process and ultimately help your firm identify the right choice for your business. In the meantime, we have outlined some of most important advantages and disadvantages of each choice and can provide you with additional information at your request. 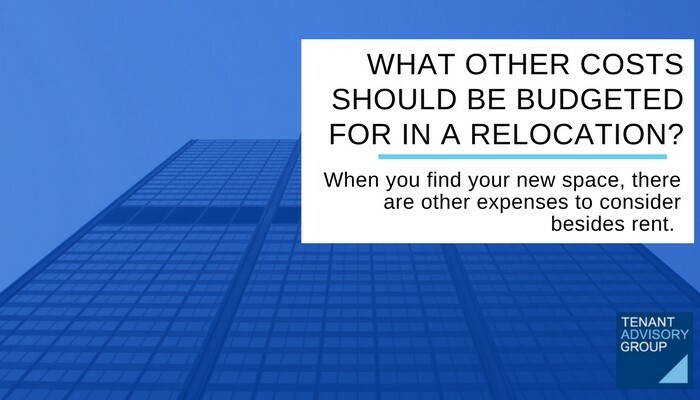 When you find your new space, there are other expenses to consider besides rent. Here are a few items that you may want to incorporate in your budget. Tenant Advisory Group has devoted much time developing a close and reliable network to help connect you with the right people who will provide you with these services. I recently came across a very interesting article regarding networking and the “golden rules” that comes with it. I would like to take this further by showing how TAG views networking and the benefits it has delivered. Tenant Advisory Group believes that networking is key for any sustainable and growing business. There is tremendous value in it and we know it works. Networking, to be precise, is not just going to an event or getting someone’ card after an interesting conversation. It includes following up, and having a one-on-one, and understanding how you can help someone else- that’s where the real “magic” happens. When you sit down with someone, you are learning how your contacts/clients may be useful to them and vise versa. In the end not everyone reciprocates but having good intentions of wanting to help others always comes back. At TAG, a substantial amount of our time is devoted to networking. We build, rebuild, and reinforce our connections. The remainder of our time goes to transactional client work. We devote a large portion of our time to relationship building so that we are more valuable to our clients and our contacts. We know that having a good network allows us to help our clients grow by connecting them to the right people. In addition, having a quality network allows us to be more of a “trusted advisor” and not just a broker. Thanks to networking and relationship building, 100% of our clients come from referrals. 50% of our clients come from our networking partners and 50% of our clients come from passed clients who are referring us to new ones! Another note to make about TAG is that we do not cold call. We find more value in warm calling and networking because we know relationship building is a long-term commitment that will pay off far greater in the long run. 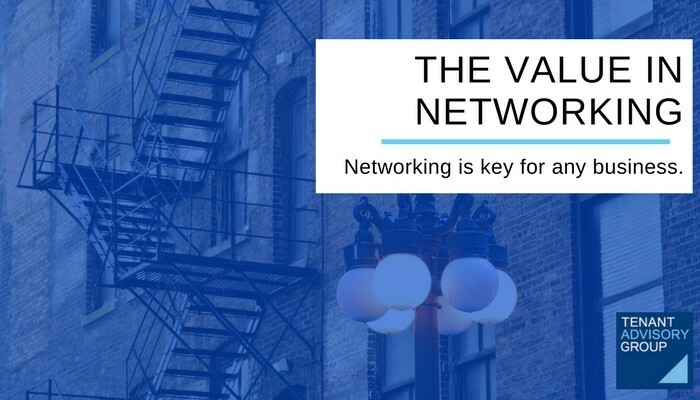 The value in networking comes with an immediate assurance and confidence because it is proven that something good will come out of it. The number of opportunities in any networking setting is countless and we try to make the most of it. Referrals are exchanged, power partners are built and reinforced, friendships are being made. We network to help our company, but we also do it to help our client’ companies. We also believe networking involves connecting people together, whether or not you are our client. That’s why people like to return the favor and keep us in mind. We actually want others to be successful even if it has nothing to do with real estate. A company is never too large or too successful to stop networking. No matter how well your business is doing, networking will be the foundation of your growth and success in the long run. You won’t regret it! I’ve had countless people ask me that question, and I’m glad they did. 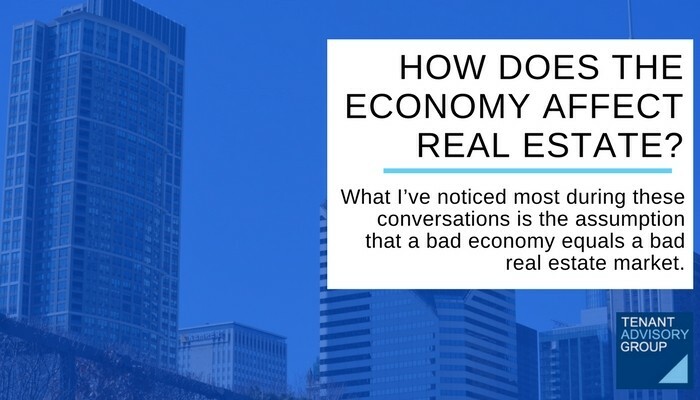 What I’ve noticed most during these conversations is the assumption that a bad economy equals a bad real estate market. My answer is that it doesn’t have to be that way. And it isn’t for TAG. In the real estate market, a bad economy may be bad for the landlord, but it is good for the tenant, which is good for our clients. During a bad economy, there tends to be a high supply of space available and a low demand for it. Businesses need less space because they are reducing their company size and make their existing spaces smaller. As a result, there is more supply available in the market than demand, and hence, the price of space goes down. Because of this, tenants are able to get better deals for a space of their choice at the lowest negotiable price. 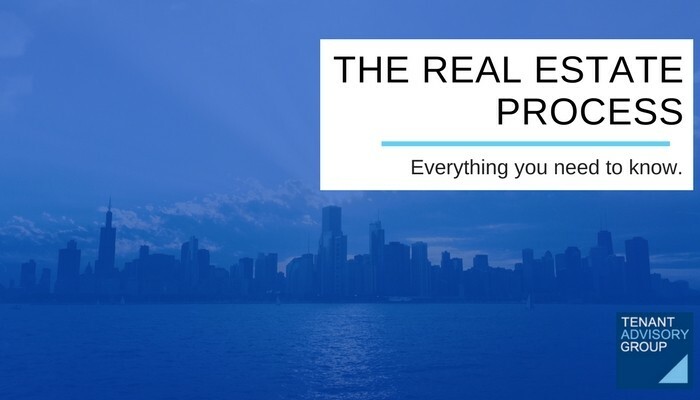 In addition, when the economy is down, competitors at other real estate firms are discouraged to stay in the market, and so unintentionally hurt themselves by giving their potential clients to the remaining real estate brokers in the market. We have seen a large uptick in clients during every downturn. When the economy is strong, landlords tend to make more money because businesses are growing and hiring more people, and so, are growing out of their existing space and needing more. This creates an increase in demand and thus, an increase in the price of space. Accordingly, competitors have the incentive to come back into the market when its doing well, which creates more competition for other real estate brokers. But competition is of no threat when you continue to create value in finding the best and most affordable space for your clients. In other words, one will always have a strong business if they provide value to their clients at all times, strong and weak markets. No one likes when the economy is in decline but Tenant Advisory Group tries to perform in a way that doesn’t depend or reflect on the economy for its success. To TAG, client and team are the two most important factors that affect our “real estate market”. According to our criteria, if the client’ needs are being met, we are doing our job. Therefore, one can control how you will do based on how you are running your business, working with your team, and meeting your clients’ needs. The economy does not have to be the scapegoat. “¢ Understand Client’ requirements in terms of budget, location, type, size and quality of space. “¢ Put together alternative options that fit Client’ requirements and organize tour with those properties. “¢ Draft and submit request for proposal that seeks to achieve all of Client’ goals, both financial and space quality and layout. “¢ Run financial analysis to clearly indicate the impactful of the landlord’ response. “¢ Draft and submit counter proposals to advance the negotiations towards achieving Client’ goals. Repeat until acceptable business terms are agreed upon. “¢ Coordinate efforts of architect to design the space to Client’ specifications. “¢ Coordinate the hiring of proper contractor and bidding process for build out. “¢ Refer qualified real estate attorneys to review lease and coordinate the lease negotiation. “¢ Introduce client to quality furniture vendor, mover, phone & data broker, insurance broker, and other ancillary professionals to help facilitate the process. Having the most knowledge and information is a huge key to any negotiation. Simply asking is one of the most effective ways of acquiring vital information. In most negotiations, it is rare one is asked for what they want in a deal. It is also rare for someone to get what they wish for without having asked for it first. If a client asks a question to the landlord or leasing agent, the client will have undoubtedly gained more than they started with. Even if the client does not acquire exactly what they desired, the client has accomplished more simply by asking. In most cases, it isn’t easy for the client to even know what to ask the landlord or how to ask the right questions. A good broker that represents his/her client’ best interests knows what to ask for and how to get it. For example, I had a client who was outgrowing his space but was still 2 years out from their lease expiration. He thought, “Oh well; I’m stuck until this lease is up and we can get the right amount space for our business.” He never thought to ask a real estate broker or consultant to give him the necessary information and knowledge regarding his situation. Just because you have a lease does not mean that nothing can be done to change it. We like to have your business drive your real estate needs and not the other way around. Contrary to what some people believe, it is more than possible to negotiate with a landlord and ask them to put your company in a new space or to restructure your existing lease. Had my client not spoken with me, he would have been stuck in space that did not fit his needs. No matter what situation or issue your company is dealing with, it is highly recommended and encouraged to ask your trusted advisors for good referrals who they recommend to help you. 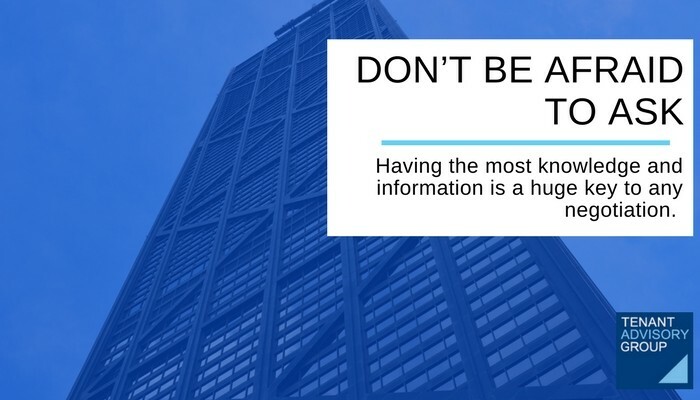 Ask your trusted advisors; real estate brokers, attorneys, bankers, or CPAs to help you get the information and knowledge you need to ask the right questions. When is the Right Time to Negotiate Your Lease? This is a question that has been posed to me hundreds of times in my career. The answer is simple: now! What I mean by that is you should review your lease on a yearly basis. A company’s business should drive its real estate needs, not the other way around. The real estate should support the business. Many people believe that a lease is a fixed liability and that nothing can be done, changed, or improved in your lease until it is a few months from lease expiration. The truth is that a lease is a more fluid document than people think. It can be amended and improved during the term of the lease depending on if you have the right leverage and story to tell your landlord. 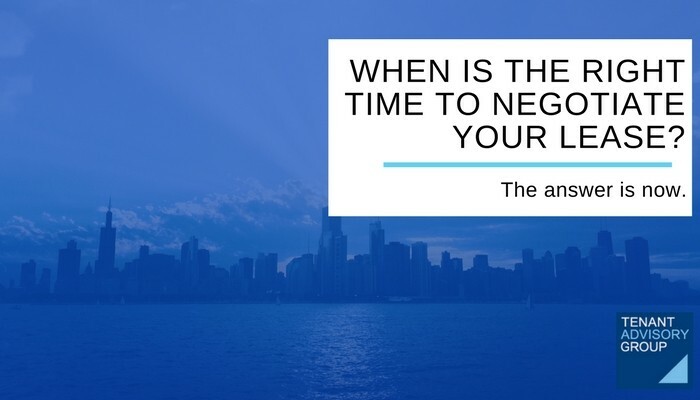 The next question I most often receive has to do with an approaching lease expiration. When should we start looking or negotiating for a renewal. The answer is that whether relocating or staying, the time frame is the same. 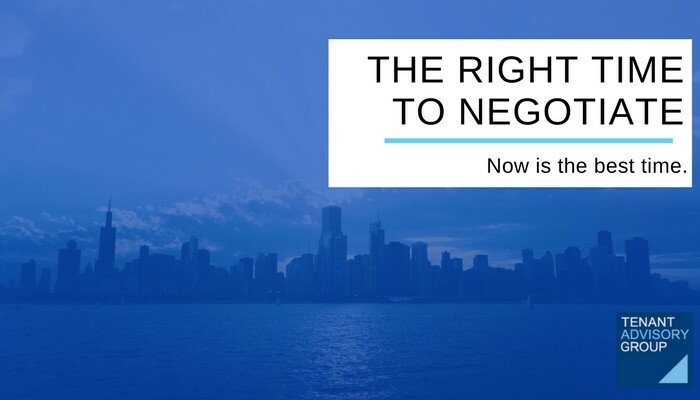 The reason is that to achieve optimal leverage and therefore optimal results in a renewal negotiation, you need to retain the perception that it is possible for your business to relocate. A relocation from site selection, negotiating business terms, negotiating the legal terms of the lease, submitting for permits, and construction can take 12-18 months, assuming the transaction is a priority for the tenant, the landlord, and the brokers. If you approach the landlord 3-6 months prior to your lease expiration, they can be quite certain you have not spoken to other properties and they will present an offer reflective of the knowledge they are not competing to retain your tenancy. In a lease negotiation, time provides the tenant with leverage. So do competing offers. Therefore, I recommend giving yourself a minimum of 12 months lead time (18 months if you are above 10,000 rsf) to begin researching the market for competitive offers. The earlier you approach your landlord, and especially if you approach them with another offer in hand, the more likely you are to get fair market terms.